This was such a fun and easy little project, and took no time at all! 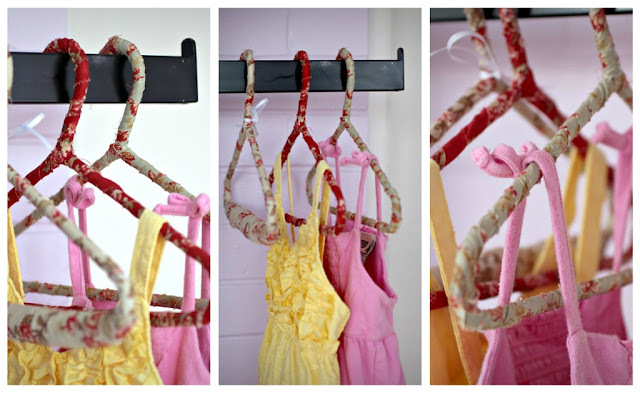 I was just looking for a fun way to spice up the girls closet, so my tutorial was done using smaller hangers, though of course it would work for any and every size. Again, like all my tutorials, its not even close to as time consuming or difficult as all pictures or text may make it appear, I just like to go into detail about the process so you can have immediate success! This is so quick and easy that you just about don't even need instructions because just by following the pictures you can see exactly how I did it. Either way give it a try and enjoy! 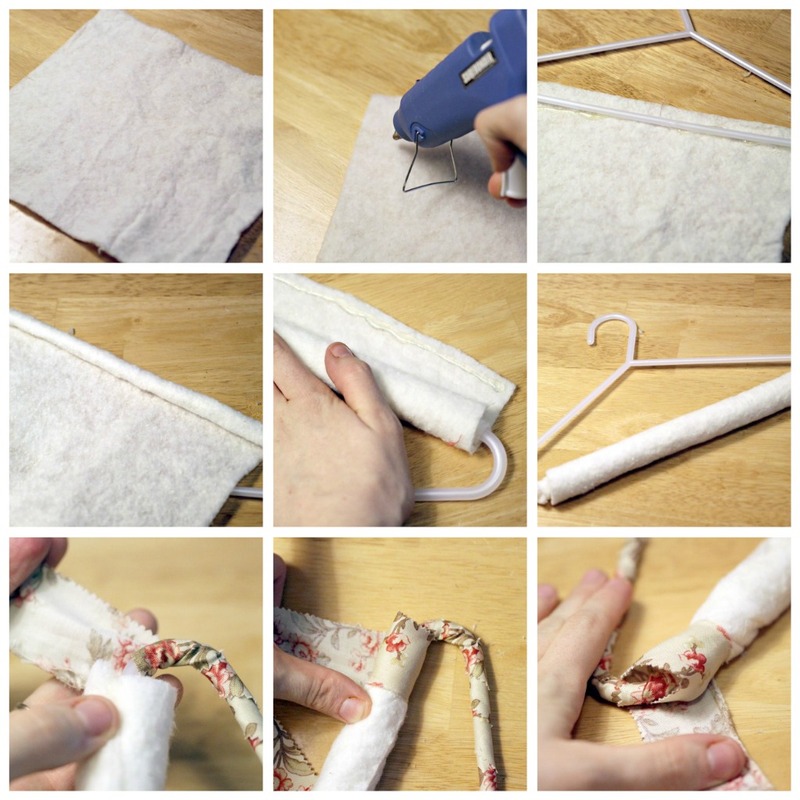 If you're using jelly roll strips like I did than you'll only need to choose one strip per hanger, just cut them down the middle. 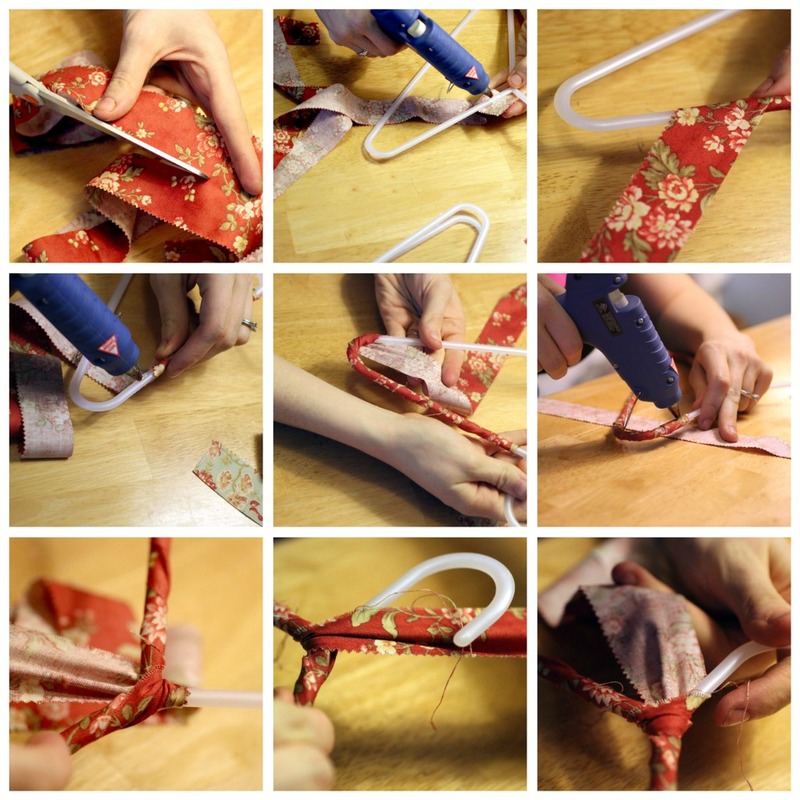 You'll want to remember to start gluing your material at a sharp angle so that your material can wind with ease. Adding a dot of hot glue about every 5 inches or so will help ensure a secure enough hold. When you run out of one strip, simply apply your glue right on top of the fabric end joint, attache your last piece of fabric, and keep right on winding and gluing!! Once you get back around to the hook, make sure you add a nice glopp of glue right on the very end of your hanger hook point so you have a nice finish. And that's all there is to it! I needed about 6 more inches of material for the padded hangers than for the none. Cut your piece of your cotton batting so it doesn't quite reach the opposite corners of your hanger. Take extra care and glue while covering the tips of the batting. You don't want batting hanging out for all the world to see:) And that's it! This was such a fun easy little project, and I just love how these hangers turned out! 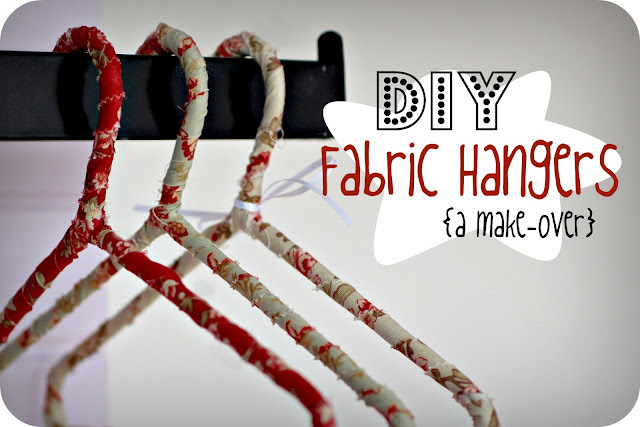 Not only are they adorable, but the fabric acts like a grip and nothing falls off anymore like those slippery plastic hangers so, I think I'm going to have to do this to all their closet hangers! I'd love to hear if any of you give this a try! Have a terrificly terrific day! Those hangers are so cute! I've seen those pretty hangers at the store selling at 3 for $15. So thanks for sharing this DIY! Those are the most awesome hangers I have ever seen. Love them! Thanks for the follow, dear. I'm honored to have you along! Returning the favor and following back. Those are too cute! I saw these on FB... so now, I'm pinning them! They would make cute housewarming presents. MY daughter and her hubby are moving into their new house soon. These would be sweet for my grand-daughters closet!